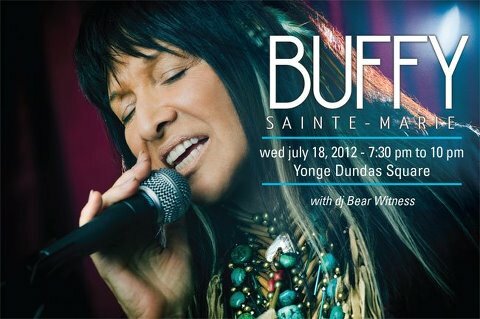 FREE BUFFY SAINTE-MARIE SHOW @ YDS JULY 18TH! The Thunderbird Aboriginal Arts, Culture and Entrepreneur Centre in association with bullDUKE Productions is proud to present Canadian icon Buffy Sainte-Marie: Live in Concert on Wednesday, July 18 from 7:30 p.m. to 10 p.m. Buffy will be performing a FREE live show at Yonge-Dundas Square which will be the first time she performs a free show to a Toronto audience! To start off the evening, DJ Bear Witness, co-founder of A Tribe Called Red, will be spinning a live set between 7:30 p.m. and 8:00 p.m.